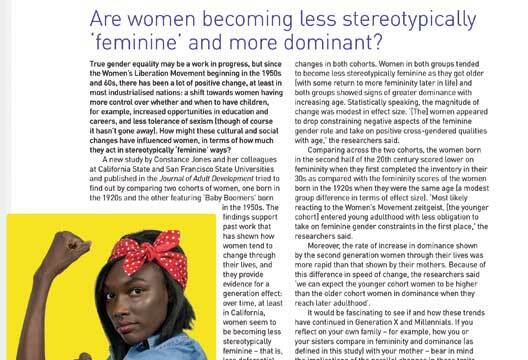 I am suspicious of the meaning of the results of the survey on femininity and dominance reported in your April 2017 issue (‘Are women becoming less stereotypically “feminine” and more dominant?’). When ‘women’s liberation’ arose in the 1970s I found the concept baffling, and simply had no idea what it was all about. Perhaps that was because of my upbringing. I was brought up in a dual-career family. My mother was a schoolmistress (and I purposefully choose the old-fashioned term). She taught in a private prep school. The school was owned by two women, who were the headmistress and second mistress respectively. Naturally they not only owned it: they managed it, both as a business and as an educational establishment. All the staff were women, until a single male (ex-Army) joined in the 1950s. With the exception, perhaps, of the woman who was in charge of the youngest children aged four, there was precious little submissiveness or dependency to be observed. I wonder what they would have made of the CPI (California Personality Inventory)? How much of the respondents’ answers genuinely reflects their beliefs and actions, and how much is mere impression management? If the latter, we are in danger of simply taking a stereotype as confirmation of a stereotype. In other words, the exercise is invalid.